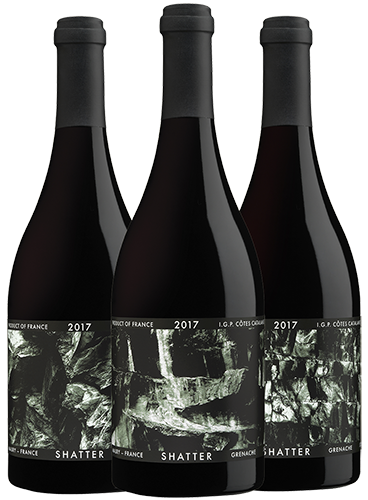 A collaboration between Joel Gott and Charles Bieler, Shatter is an obsession with Grenache and terroir. To date, it has been singularly focused on old vine, dry farmed Grenache grown in schist soils in the arid and hot valley of Maury in the Roussillon region of France. The hillside Grenache vines were planted over 60 years ago in 100% pure black schist, a slate-like, rocky soil common to the area. Though nutrient-poor, it retains heat well, allowing the slow-ripening Grenache to reach full maturity through cool nights. Tough soil, strong winds and hot days push the vines and cause shatter, or coulure, in the grape clusters, naturally thinning fruit from the vines and producing more intensely concentrated flavors.